This is one of the most frequently asked question on Ad sense and earnings in forums and groups. As Indian bloggers struggle to find good Click through rate (CTR), the questions is valid too. Let me try to answer this question with my early blogging periods and how much traffic I got to reach to the golden one dollar. 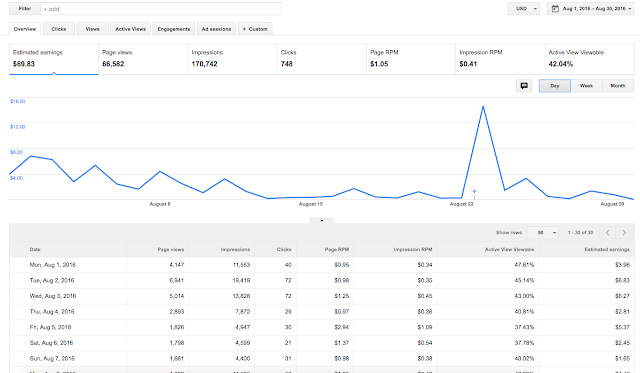 It took 1617 page views in Ad sense to get an estimated earning of $1. I took me almost 19 days to reach that number of page views, Yes, 19 days of hard work. I have posted 16 posts under 19 days, Most of the days, it was like $0.01, $0.02 and then I pray to Google Bots to put my posts first on the search list. And then some days it spiked to $0.15. Website got 3760 impressions, 11 clicks, 0.68% Page CTR (Click through rate), 0.29% Impression CTR, $0.09 CPC (Cost per click), $0.63 Page RPM (Revenue per Thousand impressions), $0.27 Impression RPM and a coverage of 84.61%. So as an Indian bloggers, this was expected though. The website had two large banner ads, one on top the posts and one below the posts and a skyscraper ad on the sidebar. Only the top ad had some clicks and others were getting mostly impressions. There are so many click bait posts to increase the page views. But in the long run, these wont work. It may give a sudden boost in traffic, but organic traffic will give consistent results. For a teach blog that gets around 800-1000 page views per day can earn up to $2-$4 as some number of clicks are expected. If the users are from abroad, like United States or Australia or Singapore, the CPC goes up and the revenue will increase up to $4-$8 a day. I guess it is clear that to earn one dollar from ad sense, a small blog from India needs more than 1500 page views approximately with a good CPC. 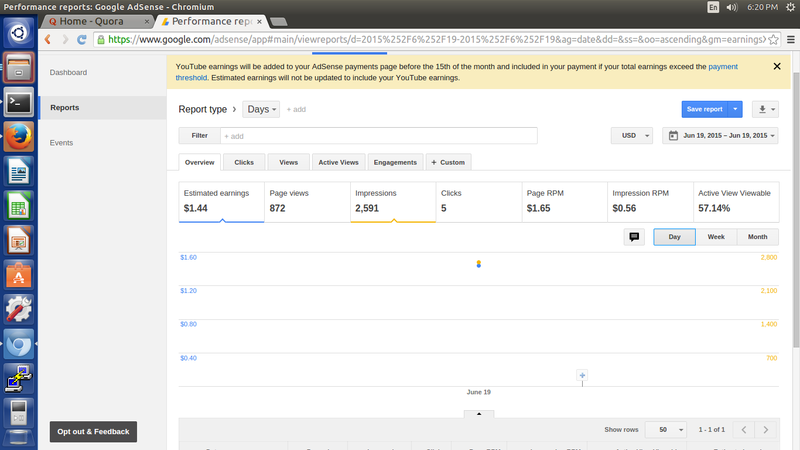 I have taken some shared screenshots of ad sense earnings in quora to show relation between traffic and income. Tipsmonk is a health niche blog and see how much it earn from Google Adsense. Currently he earn more than 500 US dollars per month.